Recently, someone told me, in the context that white people all looked the same, that I looked like Bill Gates. WTF? Bill Gates is fine, but I was going for Cary Grant. Years ago at a dinner party, the woman next to me, another graphic designer, told me I reminded her of the guy in American Psycho. I could go with this. Christian Bale explained how Tom Cruise was his inspiration for Patrick Bateman, "he just had this very intense friendliness with nothing behind the eyes, and he was really taken with this energy.” That works for me. The business card scene is, of course, one of those scenes all graphic designers love. I understand that any mention of something graphic design related in a film gets attention. We're so starved for any representation that any small bone is relished. Remember Juno? 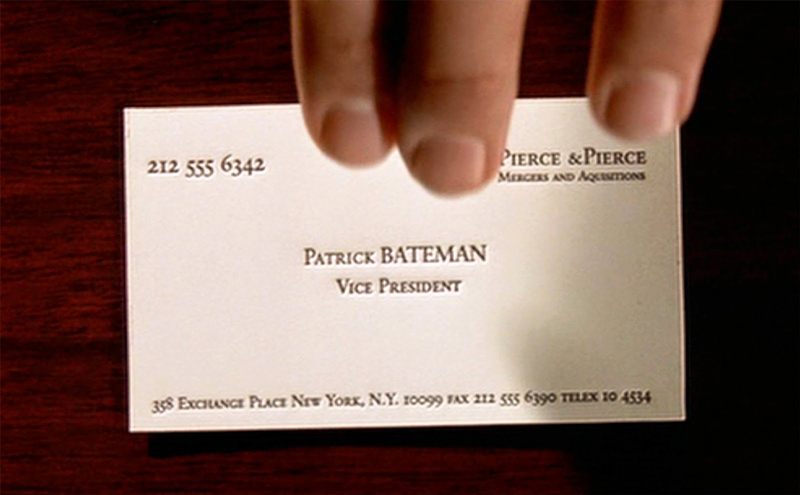 The sad fact here is that the American Psycho cards are in need of a real graphic designer. Somebody who actually understands typography and K E R N I N G small caps.